This page contains testimonials from people who have heard Lainey Feingold speak and have participated in her trainings. Visit the Speaking Page of this website for Lainey’s upcoming talks, conferences, trainings, and other presentations. Lainey speaks about negotiation skills, about her book, Structured Negotiation, A Winning Alternative to Lawsuits, about the legal side of digital accessibility, and about best practices for including people with disabilities in the digital world. Visit the Talks and Training Page for examples of what Lainey Feingold can offer a variety of audiences both in the U.S. and internationally. Structured Negotiation is an alternative to lawsuits that builds relationships and focuses on win-win solutions to legal claims. Read what people say about Lainey’s Structured Negotiation book. In January 2019 Lainey presented to David Hoffman’s class at Harvard Law School. Lainey has been a guest lecturer at Harvard Law School in two of my courses: (a) Diversity and Dispute Resolution, and (b) Legal Profession: Collaborative Law. In both of these settings Lainey’s description of her work has been a wonderful gift for my students. To my Diversity students, she provides valuable insights about how to be an effective advocate for people with disabilities. To my Collaborative Law students, she provides an all-too-rare perspective on how lawyers can get excellent results with problem-solving as opposed to saber-rattling. In November 2018 Lainey presented virtually to the Lawyer as Negotiator class at Osgoode Law School. It was a privilege to have Lainey Feingold present as part of the 2017-2018 Quinnipiac-Yale Dispute Resolution speaker series. Lainey is passionate about both ‘Structured Negotiation’ and the rights of disabled people to participate in the digital age. That passion came through in her excellent talk, which was engaging, ground-breaking and very instructive. In October 2017 Lainey spoke at the Kukin Program for Dispute Resolution at Cardozo Law School. In February 2017, Lainey presented to both students and faculty at Osgoode Hall Law School in Toronto, Canada. In January 2017 Lainey gave a book talk at her alma mater, Hastings College of the Law. Sheila Purcell, Director and Clinical Professor of Law at the school’s Center for Negotiation and Dispute Resolution commented after the presentation. JP Morgan Chase and Equip for Equality co-sponsored “Structured Negotiation: A Winning Alternative to Lawsuits” for attorneys in corporate law departments and law firms in the Chicago area. Lainey Feingold’s program was excellent. It was well-attended and participants were actively engaged, asking frequent questions and sharing their own experiences. Participants evaluating the program gave it very high marks; many reported that the program presented a practical approach to preventing litigation that warranted further consideration by their companies. Other companies should take advantage of this opportunity to host a CLE program for their in-house attorneys and law firm partners as they explore ways to resolve disputes outside the courtroom. My organization, the Legal Aid Association of California, worked with Lainey earlier this year to put on the “Advocacy Skills Training – Using ‘Structured Negotiation As An Alternative to Litigation” webinar. We received so much great feedback that we begged her to come back to do a second, more advanced training. Even before Lainey presented “Deep Dive Into Structured Negotiation: Focus on the Practitioner,” we received more comments and requests for the recording than we have for any other training. I am even getting requests for this training from our legal aid friends in other states. This training is something that the legal aid community really needs right now, and we’re so grateful that Lainey was willing to present on this for us. ARCH Disability Law Centre was thrilled and honoured to host a presentation by Lainey Feingold about her work and book titled “Structured Negotiation, A Winning Alternative to Lawsuits”. Lainey captivated a room of lawyers with her exceptional ability to inspire and she articulated a clear and pragmatic framework to achieve systemic change. Lainey does this so skillfully by challenging the legal profession to redefine its entrenched roles and beliefs. Lainey tailors her digital accessibility legal presentations to match the needs and skill level of her audiences. She offers continuing legal education talks for lawyers, “put the law in your pocket” talks for the tech sector, “digital accessibility law for advocates” and more. For five years now, the Legal Update provided by Lainey Feingold at AccessU, Knowbility’s annual accessibility skills training has been one of the most sought after sessions to attend. These are some of the comments from our attendee evaluations. For me the most valuable session was the Legal Update from Lainey Feingold. Unlike many legal discussions, it was clear, engaging and deeply informative. I am so glad I attended the legal brief from Lainey Feingold. I am usually intimidated by legal jargon, but this gave me just what I needed in terms I could understand and use. I would not have believed that a legal session could be fun before I met Lainey. I learned a lot – and enjoyed the heck out of it! In November 2017 Lainey gave a talk in Sydney, Australia co-hosted by the Digital Gap Initiative (DGI), the Public Interest Advocacy Centre (PIAC) and the Australian Human Rights Centre (now renamed the Disability Innovation Institute) at the University of new South Wales. The talk was held at the Ashurst law firm in the heart of Sydney’s CBD. The hall was packed to capacity with advocates, lawyers, and business and government sector reps. There was an indescribable buzz in the atmosphere. After the customary “Acknowledgment to Country” (a greeting acknowledging Australia’s indigenous people), Lainey talked about her book and about her work. Lainey has such a down-to-earth and genial way of delivering her message, and the audience was captivated and asked many questions. Lainey is pleased to offer interactive, hands-on Structured Negotiation training for groups interested in a deeper dive into dispute resolution without lawsuits. These trainings can be tailored to groups of lawyers, law students, non-lawyer advocates, and just about anyone who wants to develop skills to solve problems with tools of collaboration instead of weapons of conflict. Lainey gave a three hour workshop about Structured Negotiation at the 2018 National ADA Symposium. The participants were non-lawyers interested in developing advocacy skills. Lainey’s first Structured Negotiation training was held in Nashville Tennessee in February 2018. Gratitude to Disability Rights Tennessee for sponsoring and organizing the training and to The Healing Trust, a Tennessee philanthropic and advocacy organization, for providing financial support. 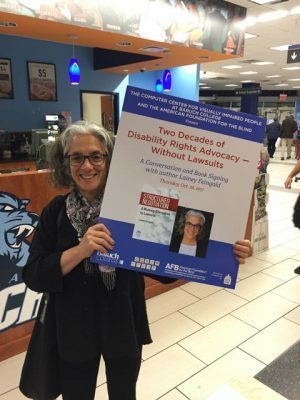 Disability Rights Tennessee was honored to have author and disability rights lawyer, Lainey Feingold, present a training for disability-rights advocates and attorneys across the state entitled Structured Negotiation: A Tool for Building Bridges, Not Burning Them. The half-day training included a fantastic introduction to Structured Negotiation, role playing exercises that engaged all participants, and a short (and much appreciated) mindfulness practice. Participants loved the training and received valuable skills and tools to further their advocacy for individuals with disabilities throughout Tennessee. I highly recommend every attorney and advocate in the disability-rights and legal services fields take advantage of Lainey’s live training and hands-on exercises on Structured Negotiation. She’s an exceptional trainer who leaves a lasting impression on her audience. The page includes comments from people in the audience who have heard Lainey Feingold speak. One person who enjoyed Lainey’s talk said she or he was surprised that a legal session could be fun. Lainey often speaks about how to resolve claims without lawsuits with a method called Structured Negotiation. Lainey also talks to audiences about the civil rights of disabled people. She also speaks to law students.